BorderLeap Game Cheats for Alpha Omega Level Sigma Answers – Unscramble each puzzle word with only first and last letters as your guide. Journey across 360 challenging levels from alpha to omega with different category. Can you solve each puzzle from the first to the last ? 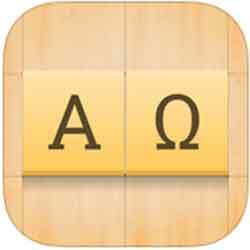 Decipher the words in Alpha Omega, a challenging new word puzzle game. Journey across 360 levels from Alpha to Omega within a unique game board laid out according to the Greek alphabet.